Recently I have been going through the several thousand new Civil War Photos that have been added to the Fold3 site. I actually have no ancestors who served in that great conflict, but I still find the photos fascinating, and I envy those whose ancestors are depicted in the several thousand indexed people-photos in the collection. However, this collection includes more than just photos of people. My favorites are of buildings (being an architecture buff), and it has been fun to cull them out and then research whether or not the buildings still stand today. Many, of course, have fallen prey to the ravages of that war, or to the time that has passed since it ended. Some have pleasantly endured. Some of the enduring buildings are famous, such as our nation’s Capitol and Ford’s Theater. Others are not quite so famous, with a sampling below. My favorite building so far, however, is one I am reasonably certain has not survived the nearly century and a half since its construction. 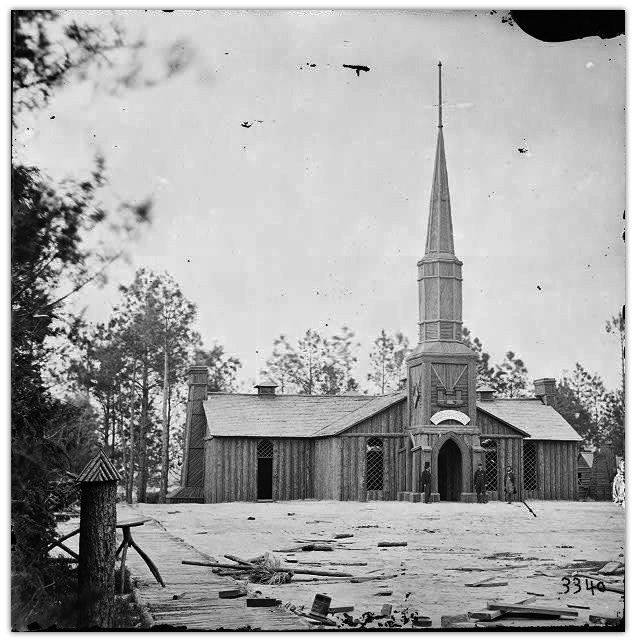 It is a log church constructed by the 50th New York Engineers in Petersburg, Virginia. Care and creativity show in every part of it. The branches used to create the “window panes”, the detailing on the base of the spire, even the little cap on the post at the front-left of the image suggest the engineers in the 50th had a lot of fun designing and building this church, fun that was probably hard to come by in the midst of that decimating conflict. Modern images from Wikimedia Commons. All other photos from the Fold3.com Civil War Photos collection. Thanks for the excellent selection of highlights! We love Fold3! could fid no record of my grandfather John Nelson Hubbard of 7th Indiana Volunteer Infantry. There were 2 John Nelson Hubbards in that unit. The other one was a musician. Your search engine seems to be flawed.